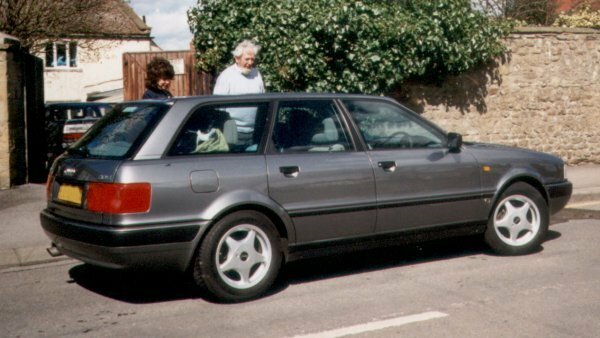 Having decided to change the Audi Coupe, I looked around the adverts for a fairly new Audi 80 Estate. The Saturday papers had a good selection. I eventually travelled to Banbury and bought the car unseen. As a reward for reaching sales targets VAG made some cars available to dealers at a cheap price. This was one such car, being the previous "model year", but spruced up with a set of alloy wheels. It was a condition of the deal from VAG to the dealer that they register it as a demonstrator first. However, as they hadn't actually got the car yet, it was registered first to me, with zero miles. At the time the list price for the car was over �000. I paid �250 in March 1994, which seemed a pretty good price, and softened the poor trade-in I got for the Audi Coupe. As you'd expect from a new car, it was pretty good. I had a Clifford alarm fitted, and fitted a decent stereo with a boot mounted CD-player. The only problem with the car was that it was seriously slow. It only had 115bhp, which was too little for a big car. However, as long as you weren't in a hurry it was not bad. I sold the car in January 1995 for �150. The buyer (a dealer from Bristol) thought that I must have taken quite a loss over 10 months, but in fact �00 depreciation over 15000 miles was not bad at all. This was the first car that I put a cherished registration on - the reg. no was different when I sold it.